To make marinade: whisk wine, lemon zest and juice, garlic, salt and pepper together in a medium bowl. Gradually whisk in oil. Place a chicken breast half between sheets of plastic wrap. Using the flat side of a meat pounder, pound the chicken until it has an even thickness of about ½ inch. Repeat with the remaining chicken breasts. Pour marinade into a large self-sealing plastic bag. Add chicken and turn to coat. Press air out of bag and close bag. Refrigerate, turning the chicken occasionally, for at least 1 or up to 3 hours, no longer. Prepare an outdoor grill for direct cooking over medium (400°F) heat. Meanwhile, make drizzle: with machine running, drop garlic through feed tube of a food processor or blender to mince. Add basil, parsley and vinegar and pulse until minced. With machine running, gradually add oil to emulsify, stopping to scrape down sides of container as needed, and process until smooth. Season with salt and pepper; set aside. Brush grill grate clean. Remove chicken from marinade and shake off the excess marinade. Place on grill and close grill lid. Cook until lightly browned on bottom, about 6 minutes. Turn and cook until other side is browned and chicken feels firm when pressed in thickest part with a finger, about 6 more minutes. If flare-ups occur (though they shouldn’t if lid is closed), move chicken to a cooler part of the grill, such as edges of grill grate of a charcoal grill or a turned-off burner of a gas grill. Remove chicken from grill, tent with aluminum foil, and let stand for 5 minutes. 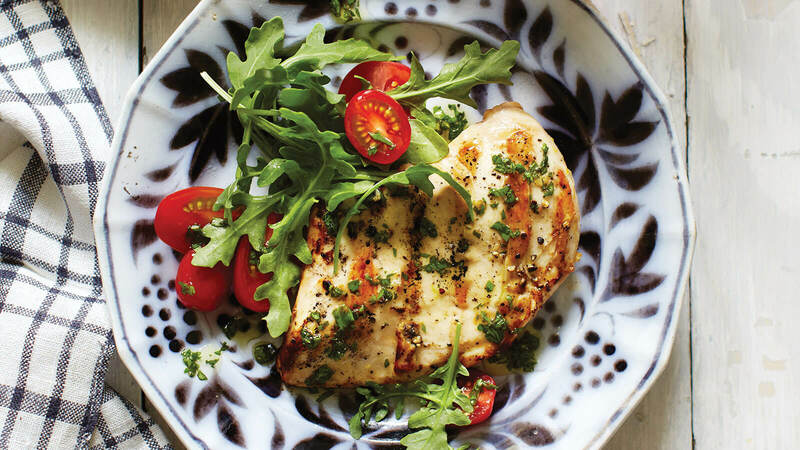 Transfer each chicken breast half to a dinner plate and drizzle with about 1 tbsp of basil drizzle; serve immediately.